Have your own way! Start your own business or become a hobby demonstrator. Whatever your reasons you can join Stampin’ Up! today and completely choose your starter kit to suit YOU! for just $169! Select your own kit by choosing $235 worth of any of our products. SU will add in a business supplies pack valued at $80 (to help you get your business started) and you’ve got products to the value of$315! That’s how simple it is to Do Things Your Way! To sign up just send me a quick email on jacquicrouch@iprimus.com.au and I’ll get you started into your own business or just receiving a very healthy discount on your supplies. OR BOTH! 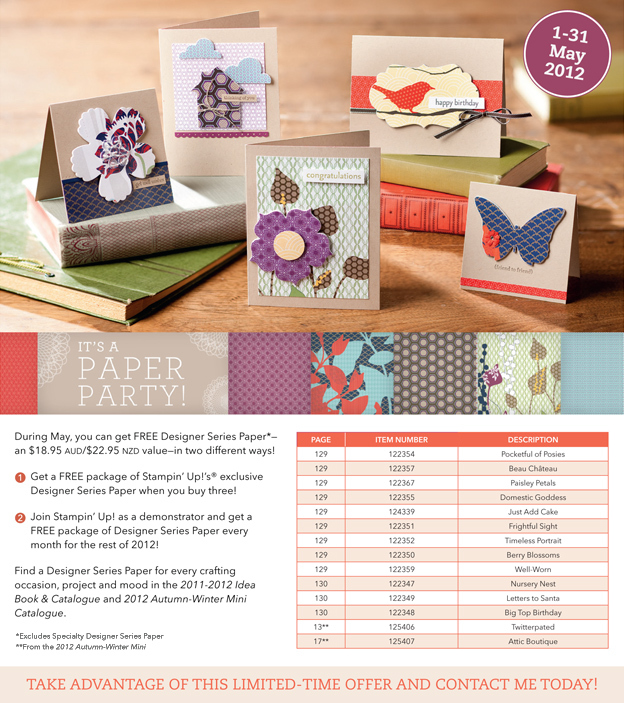 So just in case you cannot quite believe this special the deal is if you join Stampin’ Up! this month, you pay only $169, you are able to select your own kit (i.e. you get to choose EXACTLY what you want) AND you will RECEIVE FREE OF CHARGE Designer Series paper each month for the rest of the year! How good is that? So call/email me now to join my Bent Ink-linations team and enjoy free team training week ends, all assistance that you require to run the business/hobby that you want – YOUR WAY. For those that choose not to join SU there’s still some free goodies for your this month. Get a free pack of Designer Series Paper (that’s 12 sheets of 12×12 double sided designer paper, when you buy three packs (so buy three and you’ll be getting one free – that’s a whopping great saving of 25%! – Bargain). I just love free stuff, and I want you to have all the free stuff that you can get your hands on. So don’t wait. Call me now on 0410 681486 to arrange a time to discuss starting your very own business in your very own way or we can talk about your next demonstration/workshop or technique class.